When you are having a discussion about anything to do with equality from the point of view of a minority, you have to be aware that there will be objections from the majority. This is simply because to the majority, when a minority attempts to level the playing field they are removing the majority’s privileged position. There are many examples of how this works (some good some bad) and equally as many (if not more) examples of how white people object to the idea. Google it. Click here to see both on the same page. The business of acting is hardly fair anyway. The business of acting is run by the majority who often cast in their own image (the unconscious bias theory) and when caught out doing this in an egregious manner cite “the best person for the role argument” and Equity is loathe is get involved in matters of artistic taste (though as argued in another post, they should not be). Even when the whole issue is regarded as a victory for the minorities, as in the case of the Print Room, whose name has now become an industry by-word for how not to deal with racial casting issues, the other side does not need to agree. In fact not only does the Print Room still refuse to acknowledge any wrong-doing nor come close to issuing an apology, it has in fact gone so far as to threaten legal proceedings against Equity for libel. All of which brings me to the argument for Monitoring Forms. They might seem like an invasion of your privacy and oftentimes the two issues are conflated on the form. This one was collected from Yellow Earth’s recent production of Tamburlaine at the Arcola, which I watched and enjoyed on Saturday, and does not ask for your name or any identifying info, unless you opt to give your email address. The important reason for these forms is simple: Without this data, it is impossible to argue any case with accurate facts. In other words, to flip it around, it is impossible to counter-argue that, for example, the RSC did indeed employ a British East Asian Actor between 1994 and 2012. None of us were hired! They won’t provide the name of any unknown BEA actor they might have hired! It is in the past now and no use raking over it – but the point is: we do not have official statistics. They didn’t hire a BEA actor! But they can pretend they might have! Not having any official data weakens our case. We need this data going forward and you are the only one who can give it! What Equity needs, in order to be able to argue for fairness, is facts. We need therefore to have the presence of minorities actually quantified, in both on-stage roles but also back-stage roles and, crucially, audience. Equity is pressing for this and is running a campaign which itself runs alongside an industry wide TV/Film initiative, The Diamond Project, which seeks to do the same. BAFTA have even announced that unless you have a diverse cast and crew, you wont win any award! We are getting there, but it is slow going. And the last two projects mentioned don’t measure audience, which is important if you are in receipt of public money. Theatre companies like the RSC are in receipt of this money, yet they seem not to have thought about who comprises that public, especially not thinking about British East Asians much between 1994 and 2012! Companies receiving public money need to better reflect the public paying for it, and this includes women, muslims, disabled, LGBT and BAME people. My advice if you are wary of writing down your address or email is to ignore all the personal information the theatre company might want to get from you and give only the diversity information, which will help this fight. The other advice I am happy to give is that theatre companies take this more seriously themselves. 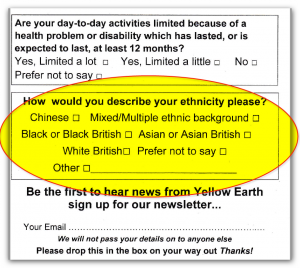 In a world where the nature of identity is being constantly challenged, the theatre producers need to prioritise gathering accurate monitoring data and not reproduce simplistic old-fashioned options that not a single of their own cast or Artistic Director could tick satisfactorily, aside from the “other” or “multiple ethnic background” boxes. If that is your area of expertise, please collect better and more expertly nuanced categories.